Holidays in South Africa offer top wildlife Game Reserves, vibrant cities and spectacular scenery. Gateway Africa offers a range of South African safaris and lodge holidays, along with private custom-made tours. These all inclusive tours range from the top luxury lodge safari vacations in the Kruger National Park, and could be combined with favourite destinations such as Cape Town, Victoria Falls, Chobe and Namibia. We also have a wide range of various budget overland trips in and around South Africa, and some also include the bordering countries of Namibia, Zimbabwe, Mozambique and even Victoria Falls. Each safari trip designed to cover their own popular attractions, ranging from Game Reserves, wine estates, tropical beaches, scenic and cultural highlights! 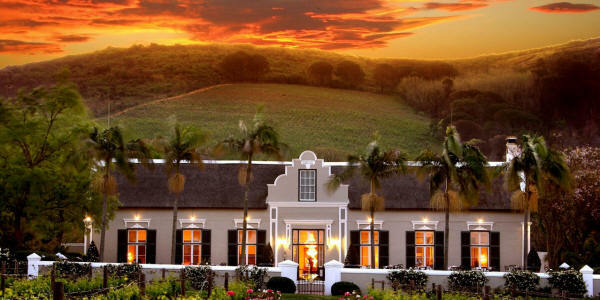 South Africa's Cape Wine Estates are well-known for their international award winning wines, making it one of the more favourite highlights on a South African itinerary. The Wine lands are divided up into 6 regions; Stellenbosch, Constantia, Franschhoek, Robertson, Paarl, and Wellington. The Stellenbosch area is the most well-known wine area. Often called the 'heart of the Wine lands', and have some of the oldest and finest wines of all the wine regions. The vast majority of the wine estates offer wine-tasting tours. Around 300 years ago in 1698, the French Huguenots first arrived in the Franschhoek area, and set down the foundations for South Africa's famed wine industry. However, earlier, in 1659 some of the best wines were recorded to have come from the Constantia Wine Estate in Cape Town, and exported to the Royal Court of France! On the 2nd February 1659, the first wine was produced by the founder of the Cape, Governor Jan van Riebeeck. The Cape Wine lands might be more known for her quality wines and estates, but the region is also of historic importance offering some of the oldest Cape-Dutch style buildings, unique to South African architecture. The typical 'Cape Dutch' style of cobbled stone paths, thatch roofs and impressive white entrances, set in scenic vineyards. The Cape Wine lands are sometimes also called the "Boland", Afrikaans word that means 'upper land', as the region is nestled between the mountains. This region include not only the more famed estates, but many smaller villages, each with their own unique wines. The Cape Wine regions are located and hour's drive, just outside of Cape Town and is a popular much-loved holiday destination for locals and foreign visitors. The regions are divided in the Paarl, Stellenbosch, Durbanville, Worchester and Franschhoek areas. The summer months are the best time to explore the Cape wine estates, from November to early March. Exploring the region in the summer enables you to experience the green beauty of this region at its peak!. Namibia: Very safe, easy to get around, affordable with high safari experience. Botswana: Very safe, moderate to get around, expensive with high safari experience. South Africa: Safety concerns, easy to get around, affordable with high safari experience. One of the most affordable ways of exploring Southern Africa, is by going on a scheduled overland tented camping safari. These is quite affordable and full of adventure, but truly a spectacular way of exploring various Southern African destinations. Often multi-country in nature, but also could concentrate on a single country. Taking this in account, adventure camping safaris is very popular in all Southern African countries. The days of really roughing it is gone (Well, you can still do it if you prefer). The majority of camping facilities used on the main-line safari routes, has nearly all the modern facilities (flush toilets and hot water showers), and generally of a higher standard if compared to camping sites in many European countries. Another point to consider: Most of our scheduled camping trips, has now an upgrade to bedded roomed accommodated option.